PRODUCT: REPLACEMENT PLASTIC END CAP (FOR 18" ADJUSTABLE ROLLER FRAME, FOR 1/4 to 5/16" PINS AND 1-1/2" ID ROLLER COVERS). 24/BAG. PRICE/BAG. 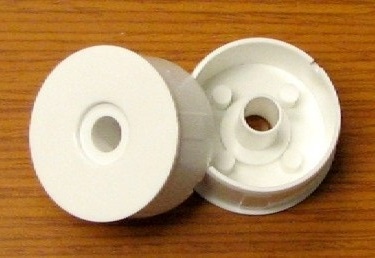 Injection molded plastic end caps with .320" ID holes fit 1/4 to 5/16" diameter pin-rollers and 1-1/2" ID Roller Covers.